You are here: Home / 0-3 Months / Is Your Crib as Safe as You Think? Don’t Believe Me? I’ve Got Proof! At what age do you think it’s okay to leave more than just a lovey? Baby 411, which is written by a spokesperson for the AAP, says you can put a board book or two in the crib, I think. This has helped our now 2year old son entertain himself before going to sleep and after waking up, but he’s pretty mellow, so I don’t know how well it would work for other babies. O think crib mirrors are OK and a hit with younger babies. Just wanted to say I agree fully! We put my 11 month old in the crib when she was not quite six months. She has always slept in a thin wearable blanket, and we didn’t even put a lovey in her crib until she was able to turn over on her own. Even now, nothing goes in her crib except her, her lovey and pacifiers. We only put breathable bumpers on after the umpteeth time she woke us up crying because she had managed to back both legs out of crib slats and couldn’t get them back in. Gheesh I wish I knew. I get tons of email and I barely respond to 5%. But a great way to get a response out of me is to put some scary “my baby only sleeps on the recliner” line in there (seriously don’t do this, although truth it will vastly increase the odds of you getting a response). I would probably approach it something like this – if I were doing something unsafe I would want YOU to tell me. Because there are a million rules for babies it’s hard to keep up, yes? So I hope you know that it’s only because I love you that I wanted to throw out the thought that (insert whatever here) might not be a great idea. The AAP safe sleep statement suggests blah blah blah…. PS Love your Etsy shop! I was meticulous is picking my daughter’s bedding. I hated everything that had bugs, monkeys, weird monochromatic designs. I finally found one that was feminine, simple, and elegant. All judging simply based on the quilt that came with it…brought it home and then realized I’ll never use the quilt. Grrr. (I blame first time parenting ignorance). I even got the bumper that comes with it at my shower, though I couldn’t remember registering for it. It’s still in the box. Why do they make them, if they are so unsafe? We have a breathable bumper, lovey, Wubbanub and a paci in there with her. It looks so bare, but I sleep better knowing she is safe. Don’t sweat the quilt. I have two (they were gifts)! We use the quilt as a playmat on the floor. It is easy to bring with us and looks great in photos! As to the bumper? I have no clue what to do with that thing! I fully agree that super careful parents can make mistakes about crib safety. I always put my baby girl down on her back, use a breathable bumper, no blankets, etc. THEN, she started to pull up so we lowered the crib mattress. About two weeks later I realized lowering the mattress exposed the outlet behind the crib that has her white noise machine plugged into it. Oops!!! The double plug cover arrives tonight from Amazon!!!! Also, for those who have beautiful quilts they can’t use…we purchased a quilt hanging rod and now have it on the wall in the nursery. Looks great and there is no risk of it getting into the crib. Funny story about a quilt on the wall above the baby’s bed. (This was before we had a video monitor) Our sleep trained munchkin used to wake up in the morning but play in her crib for a while singing and what not. Then we started hearing this strange scraping noise. After a few days we finally got our butts out of bed to see what is was. She would pull up and whip the quilt back and forth. The rod it was hanging on scraped the wall lol! I had to take it down after that. She was having a blast though. Thanks for this! Reinforces that I was going everything right. My mother, for the last 15 months (as long as my son as been alive) has been harping on me to put the bumpers in the crib! I’ve tried to tell her that it is not safe or recommend but she says we had them when we were little and we turned out just fine! She also works with families with small children and told me that one of her clients wove the bumpers between the crib rails and it was just fine! Ugh! She drives me crazy! My MIL doesn’t speak English so if she things I’m doing things wrong, the language barrier prevents me from understanding this. My daughter is 14 months and has two small loveys (aptly named Piggy & Flat Bunny because we’re very creative) and that’s it. She likes to stick her legs through the slats which is all good until we try to put her in a Pack N Play. Many frustrating grunts and crys ensue as she kicks the sides in confusion. In addition to having a safe crib at home, it’s so important to know that others are educated when caring for your children. At Thanksgiving, my daughter was staying in the spare room at my in-laws. This room’s venting doesn’t work very well & it was so cold in there (Chicago in November). I was quite frustrated with this fact so I made my husband break down the PnP to fit it through the door & move it into our room. All while our baby cried. My mother-in-law came in & said, “If she’s cold, just put a blanket on her”. Apparently, drowsy/frustrated me whisper yelled back “We can’t put a blanket on her because that will kill her!”. Dramatic & rude. But still, no blankets! Yeah Grandma stop trying to kill our baby!!! My kids have tons of stuffed animals now and not a one has a clever name – doggy, Tiger, Ralph (that one came with a name tag). I had a hard enough time naming the kids, I can’t be expected to name their toys too do I? You probably already know this, but my suggestion- Sleep sacks. I put my daughter in them sometimes if our apartment gets drafty. They’re warm and cozy like a blanket, but without the suffocation risks. The one other thing I’d note is the rule should be don’t put a baby down on her stomach to sleep unless directed to do so by a doctor. The craniofacial clinic at our children’s hospital told us to do this at our visit around six months (by which point our daughter rolled herself any which way she wanted, anyway.) So sometimes specific medical conditions affect that rule. Overall, though, I’m amazed at how hard a time people have following these. We’re on vacation and the hotel provided a crib and linens. And the first thing we had to do was remove the bumpers and blankets the had set up all neatly in it. So frustrating to see them encouraging bad habits. Breathable bumpers are supposed to be ok, and they’d still keep the pacifiers in. Though if the ball pit is working it’s probably not worth the money. Glad to hear the ball pit o pacis is working for you! I do not agree about the stomach sleeping. My son would not sleep on his back or swaddled and so in desperation, I put him on his tummy. He has slept amazingly every since and that started at 8 weeks. We have an Angel Care monitor along with a video monitor. And now at 10 months, he sleeps with a silky lovey. If you breastfeed, that cuts your risk by 50%. If you don’t smoke, that also cuts your risk in 1/2. Then if you use an Angel Care monitor, you can also have peace of mind. I know many people sleep their infants on their tummy and I do not think that is the cause of SIDs. There are many factors and no “right” answer. But it is important to have suffocation risks out of the crib, and so I do agree on that. Heaps of new moms worry over the back sleeping but have huge bumpers in the crib – that is more of a problem then sleeping on the back. Actually the medical statistics are against you on this. Tummy sleeping is a much bigger SIDS hazard than bumpers (although I’m not keen on either). Why not? Because they give people the sense that they are “protected” and thus can “safely” do things like have their baby sleep on their tummy. Don’t get me wrong – I bought one of these too because I thought it would give me extra safety. Of course I had postpartum anxiety and at the time would have bought anything that had the words “safe” and “baby” on it. Yours isn’t the only baby who sleeps amazingly on his belly. And breastfeeding and not-smoking are great! But the truth is that even when you accommodate all the potential risk factors that go into SIDS, tummy sleeping is not recommended. Here are the stats – those who are accustomed to back sleeping, then slept on their stomachs. My son is accustomed to sleeping on his stomach. SIDS is the leading cause of death for babies 1-12 months old. The peak age for SIDS death is 2 -4 months old; 90% occur between 1 – 6 months. SIDS is more likely to occur in the winter months (October – April). Unaccustomed stomach sleeping increases the risk by 18 – 20 times. My son is 10 months now, and I have no worry about it at this point (although we still use the Angel Care monitor even with a now Montessori floor bed). As a CNM, I do tell all my clients that back is best, but personally, I am not afraid of stomach sleeping. Myself and all 4 of my siblings stomach slept, and my sisters have slept all of my nieces and nephews on their tummies. I have a patient whose child died on their back after vomiting and then aspirating. That changed me and changed my thoughts about things personally. Laura – the fact that you, your sibs and your nieces and nephews slept on their tummies and didn’t die is great but irrelevant to the debate about SIDS. You know about someone whose baby died while sleeping on its back, which effects how you feel about kids sleeping on their back — this is exactly why you CANNOT let anecdotal evidence color your decision about something like this. If you want to play the risk factor game you’ll most likely win, because most kids don’t die from SIDS… but that doesn’t make you right!!! I am horrified that you (a) have clients) and (b) advise them to let their kids sleep on their stomachs. Jesus. If you had read my response I DO counsel all pts that back is best. However, for me personally the studies do not weigh out. It’s not anecdotal if you see the above research I posted from the AAP. There is low risk in stomach sleeping if you are also low risk and have been sleeping your infant that way. I go with the national recommendations in regard to education, but do not back is best in my personal household. Matt, I agree with you, but also, Laura said she tells her clients that back is best. So she isn’t advising them to have their babies sleep on their tummies, she is only doing it with her own children. And again, I agree with you that it’s a gamble I’m not willing to take, but I thought it was important to note that. No one understands SIDS but, according to the doc Laura cites, it’s possible that tummy sleeping increases the risk of SIDS — whether or not the baby is accustomed to it — because the baby doesn’t have as much ability to lift its head. This is why tummy time is key but, hey — she was apparently comfortable that her kids were little Arnold Schwarzeneggers with their trapezius muscles. The reality is that although it has not effected you, many children have died of SIDS and throwing around a few second hand statistics does not make you an expert. You have raised ONE child, experts compile research based on thousands of cases. Come on now! If you read the stats from the AAP above, the risk is low for nonsmoking, breastfeeding, tummy sleeping. I have colleagues that sit on the infant death board for our state and the number one reason for SIDS is co-sleeping in our state. NOT tummy sleeping. I feel comfortable with my low risk status and the fact that I keep my son safe by not having bumpers, blankets or anything else in his bed and use an angel care monitor. Whether you believe it or not, the stats show that his risk is very low. It’s really a moot point anyway at this time. He is 11 months old and as I watch him sleep on his baby monitor he goes from side to side and tummy. Once they can successfully move from tummy to back and back to tummy, there is no ped that recommends going in and turning your baby back over to the back all night long. SIDS risk goes down at 6 months and then again at 1 year. He’s been at this point for a long time where he has been able to move front to back and vice versa but prefers his tummy. Btw, the next cause for death after co-sleeping in our state is entrapment or wedging. Then related to soft objects in the crib. 59% of infants were placed on their backs in the summary from 2007-2009. It’s good to be informed of all the facts. Hurrah for tummy sleeping, Laura. I’m with you. If they’re big enough to rollover, I think they’re fine. My six month old just grabbed at the peanut butter in my hand too. I probably should never eat peanut butter when she’s within reach. Someone call the parent police! As an aside, JUST had a dear friend who lost one of her 8 month old twins to SIDs. She did everything right – no bumpers, always on the back, nothing in crib, etc., etc. It has been devastating. So, I do not believe back is best – it obviously does not wholly prevent SIDs. It is solely current advice as they do not know what else to say to prevent SIDs. Hold the phone here guys. Yes – once your baby is flipping over on their own then YAY you can leave them. And yes – people are getting overly freaked about peanut exposure with infants. Nobody here is a parent police. But listen – about a million people read my site each year and I try really hard to make sure that they’ll find only things that are true and safe. And what you just said just isn’t true. It’s not. There’s SIDS and SUIDS – Sudden Unexplained Infant Death Syndrome. That means that yes, in VERY RARE cases you can do everything right and still suffer a huge tragedy. It happens and it’s awful. It would be wrong however to suggest in anyway that we don’t know that “back to sleep” is best. It is and there is inarguable evidence to support this. It’s not given as advice because they don’t know what else to say. It’s given as advice because it’s been shown conclusively to dramatically reduce the incidence of SIDS. It’s one thing to say that when they’re old enough to roll over they can safely sleep on their tummy. All babies need to be put down to sleep on their backs until they’re old enough to flip on their own. Fullstop. My friend is an OB and her child’s death diagnosis was SIDs. No. I’m sorry. There is not compelling evidence to say that back sleeping prevents SIDs. It is ONE thing in a combination of many that HELPS to prevent SIDs. But is not the one thing that prevents it. Please check your research. I do not think you are sharing all the facts or stats. It IS something that is being shared as one of the ways to prevent SIDs. Like all evidence based practice, it is ever evolving. As we learn more, we do better, but as a practitioner, I have learned that science and knowledge is always changing and progressing and there is always more than one right way to do things. Back to sleep. That’s it. Just a thought for those who find crib sets with adorable quilts: buy the hardware for hanging the quilt on the wall. This kind of thing is available at sewing and quilting shops, and it makes a very easy wall decoration! It also makes the decoration easy to change when you update your baby’s room – just sub in a new quilt! This post is full of good advice. My 9 month old sleeps in a crib with the mattress all the way down, with nothing in it but a fitted sheet on the mattress, wearing a sleep sack. And she sleeps just fine! Occasionally one of her sitters will put her down with a blanket or stuffed animal, but I do not. Mainly because I don’t want her staying awake talking to said item. Another great post!! I def didnt follow all these rules with DD–i did let her nap on her tummy when she was young but i was in the room watching her so i rationalized it that way…We did start using regular bumpers with her once she was able to roll on her own (around 5 months) b/c she would hit her head, get woken up and be annoyed. They arent the flotation device type lol but they arent the breathable ones either. We have not had any issues (she is 16 months now)-she loves to snuggle up against them and sleep-we also recently started giving her a blanket but the doc said no pillow yet. At what age can you give them a flat/light pillow? My baby is just about ten months old and sleeps in a sleep sack. Just wondering what your babies wear to sleep? I feel like the sack stops him from crawling around in his crib and from pulling himself to stand up, like he does when playing on the floor. However, I am afraid to use a blanket of any kind instead. Any suggestions other than the sleep sacks? They make wearable sleep sacks that have holes for the feet, so he can still pull himself to standing and whatnot. My baby is the same age and also is in a sleep sack. I actually am glad she can’t move around too much! My friends’ babies have been pulling themselves up, getting their legs stuck, taking off their diapers, etc. I like my peacefully sleeping baby, she rolls all over but doesn’t get into any trouble so I’ve never had to “rescue” her! Besides, it’s not like they need the practice when they should be sleeping. Hi Alexis, I really appreciate your website! I wholeheartedly agree with the bare crib. However, my 9 month old has recently decided to practice his woodchuck skills on his crib rail (he pulls up and gnaws on it). We discovered this *after* he’d chipped away the wood and stain in oh, about 20 places on the side facing him. Just wondering what your thoughts are on top-rail teething pads. We’re trying one now that is secured with velcro. He’ll probably play with it and eventually figure out how to remove it, but until then I figure it’s better than him ingesting wood chips and who-knows-what chemical from the varnish. Thoughts? I am no expert, but I just wanted to let you know that when my LO was 9 months, we also discovered that he was part beaver, and purchased a top rail teething pad from Amazon. I can’t remember the brand, but it’s fleece and ties around the crib rails. I was terrified to put it on the crib, but we have never had an issue with it. The worst was when he had a horrible cold and used it as a tissue! So gross, but it is machine washable! Check out these hard plastic crib rail strips. Depending on what type of crib you have, they snap on very tightly with no fasteners, no fabric, and virtually no way baby could harm himself if he gets strong enough to remove them on his own, other than whacking them or throwing them around. Also, for this reason (and because baby would be spending a lot of time in his crib in general) we chose a crib with all non-toxic finishes from the start. I should also mention we didn’t buy this exact brand, but one similar that is BPA-free. The one we have is hard plastic, and I guess I missed the product description for the one I posted that says it’s soft plastic. Anyway, I can say from personal experience that this type of setup is best for teething. Good luck, and I hope Alexis has something to add soon about fabric teething rail protectors. I guess gnawing on BPA plastic rails is better than furniture stain? Or maybe you throw some teethers into the crib and hope baby prefers them to shellack? Also most Scandanivian countries have AMAZING prenatal care and INCREDIBLE family/child support post-birth so it’s hard to compare. A huge % of the US SIDS cases are linked to poor prenatal care (drug use, smoking, preterm birth, etc.). Thanks for being such a champion for safe sleep practices! I think many people fail to look at these risks and subsequent recommendations as a numbers game, a lottery. Well researched statistics don’t lie. It doesn’t matter if you or no one else you know has never had a problem; as soon as you choose to not follow recommendations, you are rolling the dice on your baby’s safety. Chances are, your baby will be fine. Not every baby would die even if you filled their crib to the brim with pillows and toys. It’s luck of the draw. At what point is it worth the risk? I choose not to roll the dice on this issue; there’s so many other dangers out there that I can’t control, at least I can minimize this one. But I’m with you – I stick to the science and recommendations. Because the potential risk – even if it’s really small – is to scary to play around with. Hahaha! Thanks for the idea! Will definitely consider this when Munchkin starts crawling. I like how your “safe” crib is pictured in front of what appears to be an electrical outlet. Are outlets safer for 3 year olds than babies? Thank you for your “concern” for our son’s safety! That outlet has a plastic cover on it that is screwed into the wall so prying fingers couldn’t get into it. But believe it or not, I do practice what I preach on the sleep front. Wow. Not everyone has the luxury of being able to place furniture away from an outlet. My lo’s crib is also in front of an outlet. And yes, it also has a plastic cover screwed in. Whether you follow the advice or not, there’s no need for sarcasm towards someone advocating for the safety of our children. My daughter is four months old and sleeps in a crib that only has a breathable bumper. She has a lovey, but it is dangled over the side. She rolls over wonderfully. Is it safe to put her lovey in with her? It’s a small Angel Dear one…stuffed lamb head with 12×12 mini blankey attached. Can you write something about the “drop crib” epidemic? We are inheriting a crib, and it was used by at least three kids, and everyone is fine. 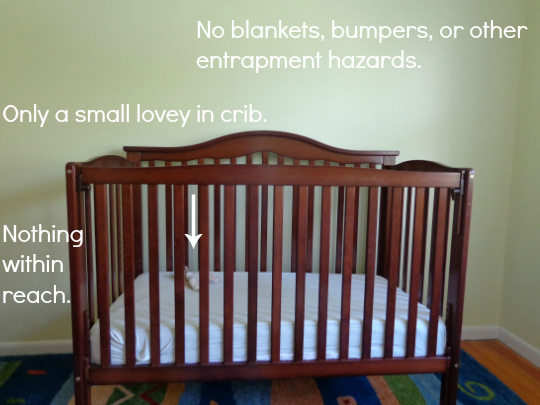 But it is considered a “drop crib”. Are you adamantly against that, or is it OK to use? Most people I know did not get rid of their cribs when the discussion about this started. But if you’re buying a new one, it’s not even an option anymore. We also inherited a drop-side crib. It held two kids before us, and now my second daughter is in it. I actually adored the drop-side feature, but the issue came to light right before our youngest was born. Every manufacturer of drop sided cribs should have a kit that will make that feature non-functional. That’s what we bought. A heck of a lot cheaper than a new crib!!! We have a drop-side crib we used for my older son (now 5). The manufacturer suppled a kit to secure the drop side and we’re using it that way for #2. If the crib is old (3 kids so I’m assuming it’s 6+ years old?) it may be worth investing in a new one. You can manually inspect the hardware and some manufacturers will give you a “lock down” kit so that it can’t fall. But I’m leaning towards finding a new inexpensive one only because the one you have seems…well used? I’ll be honest, my 3 YO was in a dropside crib that WAS 5 years old. I’m lucky in that my husband has a PhD in Mechanical Engineering so when he inspected/test it and declared it was safe and in no way a danger of “dropping unexpectedly” I went with that. Not everybody has a mechanical expert living in their house though so I suppose it’s a case by case basis. 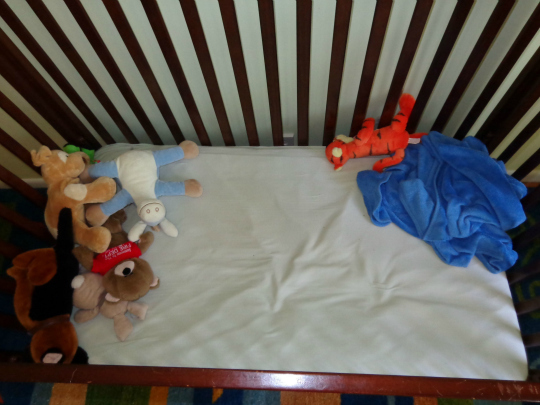 And on a side note, our crib is totally empty (except the baby, on good nights…) We’ve never had any problems. He gets his hands/feet out of the crib rails, but thus far (knock on wood) hasn’t gotten them stuck. I figure for the most part, if he can get them out, he can get them back in, and it’s worked. The bumpers thing drives me batty. I want to call my friends who register for them and tell them not to use them! But I did find an idea on-line where people turned their bumpers (from a set) into a valence for the nursery’s windows. So if you get them with a crib set, that’s a thought! I honestly believe that the reason the official line on “back to sleep till 1” is to keep it REALLY CONSISTENT. There are plenty of Moms out there who are fuzzy about the “back to sleep” rule so I think the RULE is really about being clear and consistent. When my 6mo was born my MIL kept pressuring me to go run errands, get out of the house, etc. It was around Christmas so I dashed out a few times to do some last minute shopping. One time I came home and she had him on his tummy in the pack n play with like 3 blankets on top of him at 2 weeks old. She’s also a health care provider that works with infants. So frustrating!!! I didn’t realize bumpers were such a hazard once they were able to flip both ways? Many of my friends have the relatively thin ones and I was considering it myself to avoid limbs in the slats. Oops!! Breathable bumpers are supposed to be OK, I think. They don’t provide any cushioning but they cover the gaps between the slats. Haha we were typing the exact same thing at the same time! I’m glad you know about this too. So far my mom has had 12 grandchildren all sleep on mattresses with the baby safe cover (she buys them for us) and they did not get SIDS. That’s a small number compared to babysafe’s study but its made all my siblings/parents of the babies feel much better with having the cover on. I don’t use the sleep sack. I put my boy in pajamas and that’s it. I regulate the temperature on our thermostat (he also tends to be a warm body like his dad). I have a sleep sack but the pajamas were working great so I have never used it. When he was 1-3.5 months I did swaddle him and use the swing. Once I transitioned him to his crib at 3.5 mons I just started using the baby safe cover from NZ that goes around the mattress and pajamas and a binky and I lay him on his back. He also flips himself on his side or stomach but as long as he flips himself from what I’ve read here its fine. Sometimes when he is deep asleep my husband or I will flip him back on his back but inevitably he ends up on his side or stomach again. I’m not entirely convinced about the “mattress fumes” thing only because SIDS can occur on many sleep surfaces, not just baby mattresses. That being said I TOTALLY believe that manufacturing chemicals are probably horrible and would not at all be surprised to find out someday that it’s totally a contributing factor. I live in NZ and discussed this with my Plunket nurse (we get home visits till our baby is 3 months old from the nurses then we visit them at the clinic till they are 1yo) and they did not recommend using the wrap. Their key points we ‘sleep on their back, face uncovered and smoke free environment’….. So we’ve never used bumpers. We’ve had a big problem with A’s paci rolling out of the bed. That’s over now because we’ve taken her paci away, but the hunts in the middle of the night, in the dark, on the floor were not fun… My mother, who raised 10 children (yes, 10) used bumpers and blankets for every single one with no problem, kept telling me to just use bumpers already. It is hard to think of your baby hitting hard wood as she rolls around in the middle of the night. That’s why people are still using bumpers, IMO… there just doesn’t seem to be a good crib design out there. You said that it’s hard to think of Baby rolling around hitting hard wood in the crib. You’re right — that is a reason people still want to use them (besides them being “cute” and coming in a bedding set). It really is NOT going to harm them to be in a crib without bumpers. Plus many new moms are horrified that an arm or leg will get stuck and their baby will be in pain. I know a lot of moms cringe to think that the baby will bonk his or her head rolling to the side slat or seriously injure a leg. They won’t break their arms or legs if they get stuck through a slat, or even come close to hitting their head hard enough. I’ve found my 5m old recently rolled completely up against the side of the crib with his face against a wooden slat and sleeping soundly (lol). I’d hate to think of his face buried in a pillowy bumper, OR get tangled in the ties that come with some older bumpers. In my experience, which is limited, my first baby spent a few nights waking up crying because a leg was stuck through a slat and he couldn’t get it out. It took about a week of doing that before he could un-stick himself and was fine and now he’s in a twin bed. The risk of fluffy, fabric bumpers vs. the “risk” of a baby seriously harming themselves by rolling against a wooden crib slat is really not a comparison at all. It’s just not worth the risk to me. You don’t WANT your newborn or infant sleeping “that soundly” by putting them on their tummy. I read that could be part of the problem – they are not able to rouse themselves awake well enough due to either environmental or biologcal factors. Nearly ALL babies will sleep better on their tummies, but the issue is safety not better sleep. They learn to roll around 4-6 months anyway… just wait it out. Sorry, meant to add my first baby is almost THREE yrs old now and in a twin bed. 😉 I didn’t put my baby in a twin, lol. NOT RECOMMENDED! Baby quilts are GREAT!! To put baby on to play on the floor, to put baby down in the grass at the park, to cover your duvet cover when you lie baby down on your bed to hang out with you…. there are zillions of uses for baby quilts. Just don’t use them in the crib. See I get that quilts are cool but they’re too expensive to put in the grass! We have an old dumpy blanket I whip out for picnics but even though my kids are too old to want a baby quilt in their room I still can’t bring myself to get dirt/grass stains on that $100 quilt. Which now sits in the closet and is useless. Just wanted to echo the thoughts about quilt-as-wall-hanging. We got the stupid expensive PB quilt knowing it couldn’t be safely used in the crib, but I know we will use it once we convert the crib to a toddler bed, and in the meantime we slipped a cheap Ikea rod through the built-in rod pocket and hang it on the wall. This is a great solution for apartment-dwellers who can’t paint the baby’s room but want to add some color and softness to the room. My best friend’s mom also made her a second quilt to coordinate with our set so we can change things up a bit when we feel like it. Thanks again for all your great advice. I’m feeling encouraged that we can get out of this rut! I just want to point out that SIDS is not suffocation, so I am not sure what the relationship between the babysafe mattress and no SIDS deaths is other than coincidence. That no babies who are on this mattress have died of SIDS is great, but it’s not because of the mattress. This is not to say that the mattress can’t be used, it’s only to say that it shouldn’t be assumed that your baby won’t die of SIDS if you use it. 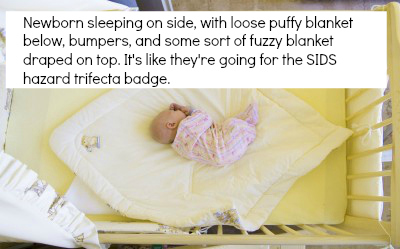 Keep in mind that most babies won’t die of SIDS, anyway! It’s extremely rare. Whew! SIDS is the term that pathologists who are doing autopsies on deceased babies use for the cause of death when all other causes are ruled out (suffocation, illness, etc). When no cause is found (unexplained), the term SIDS is used. It is thought that SIDS has something to do with the brain’s sleep/wake mechanisms not working properly but this is still being researched. The stats that are mentioned are based on what was going on in the home, with the baby, etc who gets a SIDS diagnosis. Most were asleep on their tummies, hence the recommendation to sleep on back which is prob the most important thing a parent can do to reduce risk. 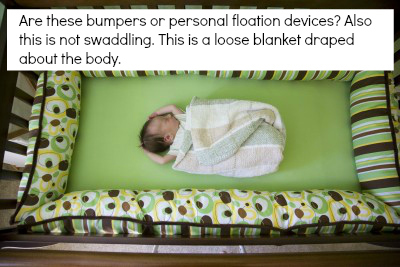 Other “safe” habits like not using bumpers, blankets, toys, no couch sleeping, etc are more to prevent suffocation death, not SIDS. All are good to practice for safe sleeping! Great article! I just want to point out that your opinion is not fact, nor have you gone to the website and done the necessary research to claim that the babysafe matress COVER (not mattress) can prevent SIDS. please, Go to the baby safe matress website to read & study about it if you are “unsure” Of what it is and why its effective. It’s not a mattress, it’s a mattress cover. A scientist found a cause and effect/ relationship to SIDS and the chemicals used in baby mattresses and bedding which release certain toxins which can stop breathing in babies. Yes SIDS is rare but the study included babies usind and not using the cover and in the same time period that over 975 died of SIDS NOT using the cover 0 ZERO died using the cover. Please do your research before stating that you know a product is not able to prevent SIDS. I urge you and others to go to the website and read about the scientists in New Zealand that found this correlation. Knowledge is protection and power. It’s an interesting point. My understanding is that SUIDS (sudden unexplained infant death syndrome) is the technical term for when pathologists can find no cause of death. SIDS (sudden infant death syndrome) is the term for an infant who dies and there is determined to be a cause of death which tends to be linked to breathing recirculated air (ex. head was covered by a blanket) or some other physical scenario that resulted in insufficient oxygen intake. If an adult sleeps under a heavy quilt and isn’t getting enough oxygen your body will wake you up and you’ll move to remedy the situation. Infants haven’t yet developed this capability and/or are physically unable to remedy the situation. So based on my understanding the mattress/chemical theory could totally hold water because infants could be put in a position where the chemicals from manufacturing overwhelm their breathing. I’m not saying I’m 100% sold on the idea, but I totally think that it could be found to be true in the future. Also I hate talking about this because discussing the reasons why infants die is too horrible to contemplate. Ugh…. Emily I hear you. Some nights it sounds like my daughter is playing a football game. That said she doesn’t wake up or seem to mind so we just shrug it off. We’ve been using a breathable sleepsack since three months and it’s worked quite well. I am always glad to hear about safe sleeping conditions as it’s not always clear what you should do. Great article Alexis. PS. Your daughter probably is playing a football game. Mine figured he could kick the wall through the crib slats. It used to sound like he was hosting a drum circle in there. Like so many new moms I bought the whole crib “set”. Bumpers, thick adorable quilt, ect. I bought cute stuffed animals to match too. Thankfully I’m an Internet advice junkie & learned the error of my ways before my baby graced us with his presence. I pray that baby stores everywhere just quit selling the stuff soon! Yes, your grandmother laid you on your stomach, covered you with blankets and gave you vodka for teeth pain & you survived, but this is 2013 & constant research has taught us a much better & safer way of doing things. Anyway, I’m thankful for people like you who raise awareness of better sleeping habits for babies. I always enjoy reading your emails! I thought you weren’t suppose to put lovies or anything in the crib with them until they 1 years old? Is it okay to put a small security blanket or a lovie in his crib with him? I’ve been confused about this too. How big should a lovey be? What about those small combo stuffed animal, blanket things? My 6 mo old loves it but I always take it away from him once he falls asleep. The official AAP statement says no loveys till 1 year. Dr. Karp (who I love) says you can introduce them at 6 months. And by “lovey” he means something that is the small combo blanket thing you are thinking of. It’s not a security BLANKET, they’re generally less than a 12″X 12″ square. Thanks for the reply! His security blanket is an Aden and Anais muslin small (16×16) blanket. It can help him fall asleep. What I have been doing is letting him have it to fall asleep and taking it away once he’s asleep. Thanks for the info. I must say we have used bumpers since our bub was 6 months old as he travels the entire bed bed and kept bumping his head as well as getting arms and legs stuck, a few 2 am screams saw me put the bumpers in and no more dramas…before that he slept in bed with me (another no no) there is much to be learnt still about SIDS and doctors usually can’t pin point a cause. I was speaking to paediatrician who said he believes that some babies have cardiac arrhythmia’s leading to death 🙁 not necessarily anything that we can really prevent! I agree that we can’t really pinpoint the cause. But we can pinpoint the results which are fairly unambiguous. So we know that removing things like blanket, bumpers, and putting babies on backs to sleep results in a dramatic lessening of the rate of SIDS. If it were something “built in” (like arrhythmia or whatever) you wouldn’t see any change by making environmental changes. Since this is my first comment, I first want to say that this blog has been a total lifesaver for my husband and me. This isn’t because our baby is a BAD sleeper (actually, she’s pretty magnificent), but because you have been able to give me good sleep advice that’s research-based and pretty much entirely in line with my parenting philosophy. You have helped me tune out the noise of too much advice. Thank you. That being said, we have recently committed a safe-sleep sin by buying and installing bumpers. In the past couple of weeks, my daughter has been repeatedly hitting her head on the crib, wedging herself in the corner, or getting her limbs stuck outside the bars. Since she is a proficient roller (both ways), this has become a bit of a safety risk in itself. We had to install bumpers–the regular kind–to keep her from continuing to wake up with redness/bruising on her head and to keep her arms and legs inside the crib. While I have totally toed the line on AAP sleep advice up to this point, this is one time when I found that it just wasn’t working for me. I agree very much with most of what you’ve posted and I really appreciate the emphasis on having a bare crib. 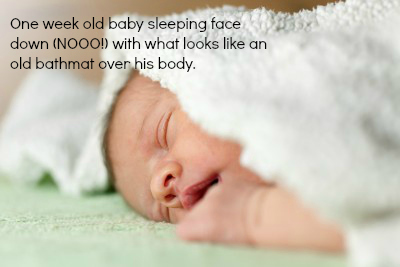 I want to point out, though, that most of those beautiful pictures of babies under fluffy blankets (or bathmats!) are not sleeping pictures, but newborn portraits. Most of them are professional quality and are a trend in baby photography – I’m sure that most have nothing to do with the actual environment that those babies sleep in. I honestly have no issue with funky newborn photos! Put your newborn baby in a basket of laundry, dress them like owls and have them sleep in a “nest” or what have you. I get the whole newborn photo thing (although frankly it’s not my bag – I’m more of a “chubby 8 month old baby photo” gal myself). i followed all the rules, or tried to with my now 8 month old. she however, has a mind of her own. since a week old ive found her on her stomach every morning, since 6 months, ive found her out of the crib every morning! needless to say, the crib is now converted to a daybed, with a rail along the side, a baby gate at her bedroom door, every single outlet in the room covered. now shes escaping the room too, so ive got a lock on the toilet in the bathroom next to her room. she hasnt napped since 3 months old! i adore her, but im nearly out of hair to tear out now! that said, i absolutely love your blog, and the overstuffed toys, blankets and bumpers drive me nuts too. we just used the breathable one. As soon as I put my almost 6 month old son in his crib, he immediately rolls over on his tummy, and then about half the time proceeds to fall asleep with his FACE DOWN – literally, face buried in the mattress so I can’t even see his little button nose. Has anyone else experienced this face down issue? Should I be worried? Is there anything I can do? I keep checking up on him and turning his face to the side for naps, but obviously cannot always do this at night. He is otherwise healthy, seems to breathe in his sleep ok and his crib is junk-free :). I’m a mom to be, I won’t be using the bumpers either. I’m even worried about the crib rail covers but I know I’d rather have something on the rails than have our little one gnaw at paint varnish, wood, etc. BTW, I ALMOST was a victim of SIDS. I was 2 weeks old, napping on a bed and someone came by to check on me and noticed me turning blue. I was in the hospital for a few days. Mind you, this was in the 70s. Back then parents were encouraged to put babies on their stomach in case they aspirated while on their backs. Wow how times have changed huh? What caused the choking, we’ll never know. but I’m here today! I’m going to be a new mom soon. Yeahh… But wait. I’m sure all moms know the mixed emotional turmoil that I’m going through right now. On one hand, I’m so excited that I’m finally going to hold my baby in my arms. On the other hand, I’m so freaked out by all the safety issues concerning newborn. I’m trying to set up the best crib for my newborn but there are just so many confusion right now. Did you just say no bumper is supposed to be on the crib? I heard some stories from parents on how they found their newborns to be banging around the cribs every time. That’s why some of them decided to put the bumper on no matter what. Anyone can enlighten me on this? No bumper. For starters your newborn is unlikely to be sleeping in the crib for months. Secondly bumpers are a potential SIDS/entrapment hazard. Most babies aren’t that mobile for months. Ideally you’re swaddling which means they’re physically incapable of getting around in the crib. So from a practical perspective your baby won’t even BE in the crib and if they ARE in there, they’re unable to move around in there. Though the first week was rough, my husband and I got our daughter sleeping, swaddled, in her crib (not falling asleep, but sleeping) in her crib when she was a week old. Flash forward 5 weeks, I have a doctor’s appointment and we leave her with my grandmother for a couple hours. By this point, my grandmother and I have discussed how in her day they were told to put babies to sleep on their stomachs and how things change and we’re putting our daughter down on her back because based on what we know now, it’s safest. But lo and behold, we come home to find our daughter in her crib on her stomach, swaddled in a heavy fleece Halo sleepsack (you know, the ones that have “Back is Best” plastered on the front of them). That was nearly a year ago and I still don’t really trust her with my child. Ouch! Grandparents can be tricky. On the one hand they’re part of a select group of people on the planet who would willingly lay down their lives for your child. And that’s a pretty heady concept when you think about it. But on the other, they often think that the way they did things ~30 years ago is still OK and refuse to listen to modern safety guidelines. I hope you guys can get past this and find some trust in the future – some on Grandma, get with the modern era! Hi! would you happen to remember what kind of lovey you got? The official AAP recommendation is nothing in the crib till 1 – that includes blankets, bumpers, pillows, and loveys. Does that mean that a small lovey is a huge safety hazard for your 10 month old? I don’t think so. There’s no hard evidence that it’s an issue, but the AAP wants to be as conservative as possible. My advice is to show your lovey to your pediatrician and discuss when it’s OK.
What about the Angel Dear Loveys? My 3.5 month old is swaddled now and loves to nuzzel his cheek against it. I am starting to have visions of when we transition out of swaddle, I just know he’s going to plop it right on his face to sleep. Maybe I should just give it the boot while he’s this young and switch to an actual little stuffed animal to nuzzle instead. I am generally a fan of this site and glad you have a page devoted to safety, but I am also a bit concerned with other unsafe recommendations I see. While I know Dr. Karp is cool with swing sleeping, the AAP is not ok with any surfaces that are not flat. Only a crib, bassinet, or pack and play are approved and truly safe sleep surfaces, without any modifications. Even a “breathable” bumper can be an entrapment and entanglement risk. I would love to see this site adopt a 100% safe sleep stance!